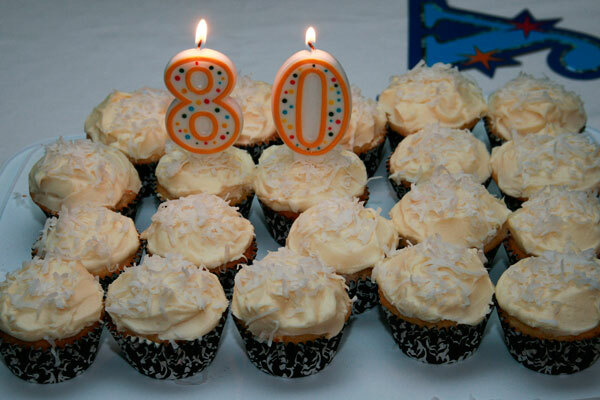 This weekend we celebrated a very special occasion: Nick’s grandmother’s 80th birthday. 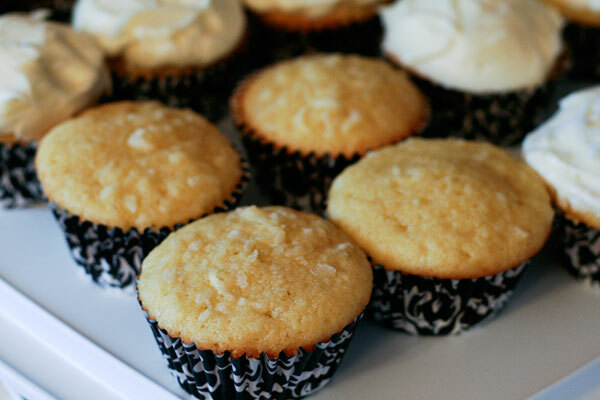 A little birdie told me about her fondness for coconut, so I baked the very best coconut cupcakes I could. And they were pretty darn good. I know because I sampled one on Saturday morning before we left for Lancaster. 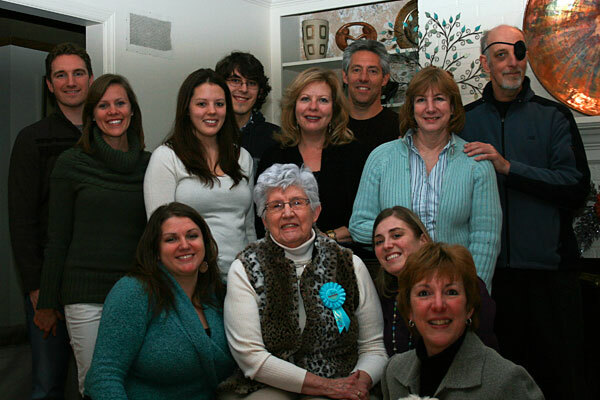 We gathered with aunts, uncles, cousins, siblings, and, of course, the matriarch of the Bomgardner clan. 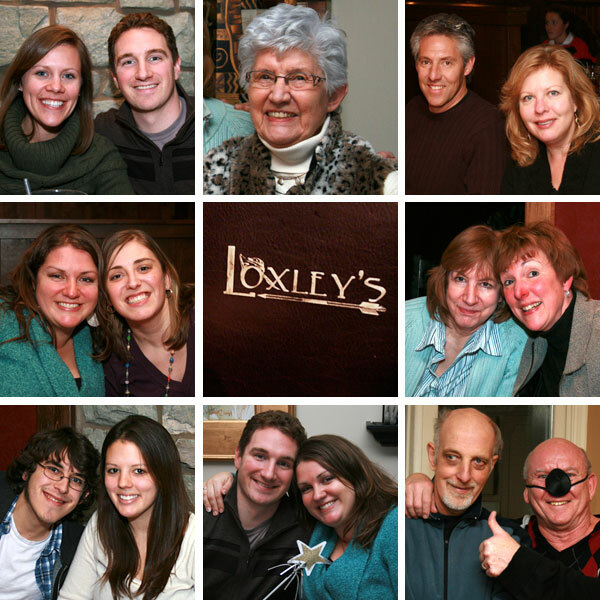 The thirteen of us enjoyed dinner at Loxley’s where, yes, it felt as though we were eating inside Sherwood Forest. In addition to singing “happy birthday” to Grandma and snacking on crunchy sweet potato fries, the highlight of the night was learning that 5% of our total bill is donated to a charity of our choice. In the spirit of Robin Hood, you know? When we got back to the Nagle’s house, we lit the candles and sang again. And the cupcakes were a hit! 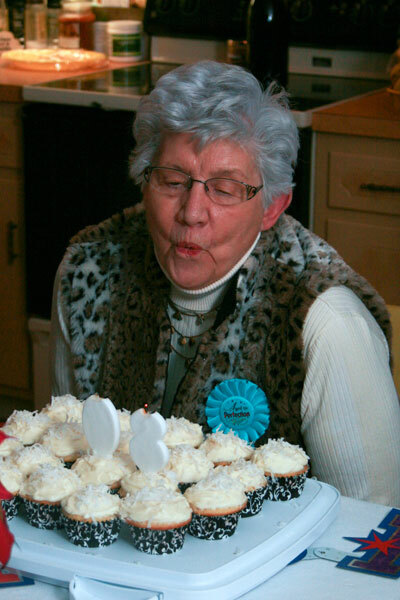 Grandma even said she prefers a dense cupcake — I really couldn’t have selected a better recipe. These goodies contain a lot of butter, a lot of eggs, and a lot of buttermilk. (Which is why they should be reserved for special occasions only.) But the secret ingredient is almond extract. It pairs perfectly with the coconut and vanilla flavors. Here’s a shot of everyone who was able to make the trip. We certainly missed the rest of you! Happy birthday to you, Grandma! Cream butter and sugar with electric mixer on high speed until light and fluffy, about 5 minutes. With mixer on low speed, add eggs, 1 at a time, scraping down the bowl after each addition. Add vanilla and almond extracts and mix well. In a separate bowl, sift together flour, baking powder, baking soda, and salt. In 3 parts, alternately add dry ingredients and buttermilk to batter, beginning and ending with the dry. Mix until just combined. Fold in 7 oz of coconut. Line a muffin tin with paper liners. Fill each liner 3/4 full with batter. Bake for 25 to 35 minutes, until tops are brown and a toothpick comes out clean. Allow to cool in the pan for 15 minutes. Remove to a baking rack and cool completely. Meanwhile, make the frosting. Cream together cream cheese, butter, and vanilla and almond extracts with electric mixer on low speed. Add confectioners’ sugar and mix until smooth. 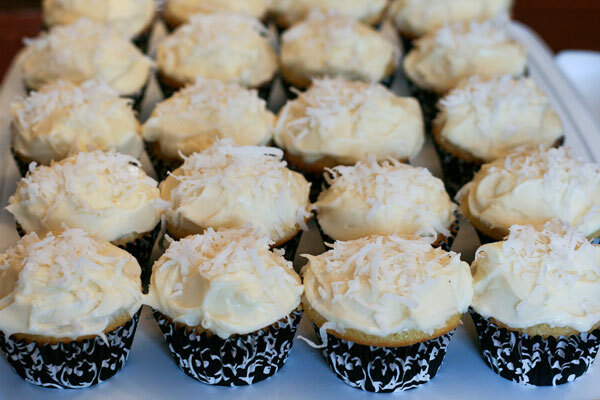 Frost cupcakes and sprinkle with remaining coconut. Refrigerate if not serving immediately. Thank you for the absolutely delicious coconut cupcakes. Also thank you for helping to make this birthday celebration so very special. Love your pretty cupcake liners! 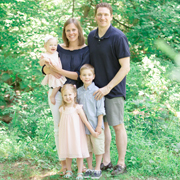 I pick those up whenever I see them – they make muffins and cupcakes so festive and pretty. your cupcakes look adoreable:) thanks for sharing this post. What a special party! And those cupcakes? They look heavenly!